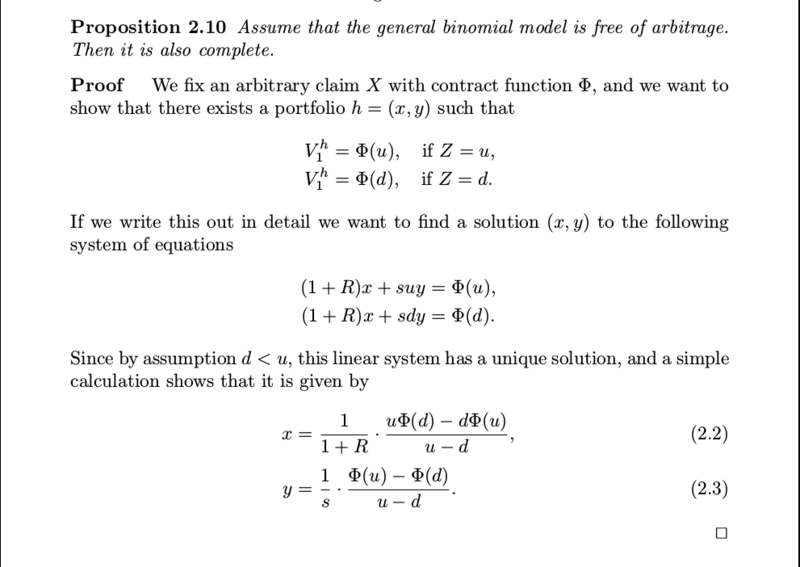 Proposition 2.10 of Tomas Bjork's "Arbitrage Theory in Continuous Time" states that if the general binomial model is free of arbitrage then it is also complete i.e. every contingent claim has a replicating portfolio. Note that this exact question has already been asked and answered here, but I don't think that the answers are satisfactory because in the chosen answer he says that the system of linear equations only has a proof if $d < u$, but this is not true because it has a solution in the case that $d > u$ by symmetry and in the case of $d = u$ because then the two linear equations are the same. Also, the answer claims that by Proposition 2.3 $d < 1 + R < u$, but in the actual proposition these inequalities aren't strict! I'm not sure I really understand the top voted answer, but I get the feeling it is also not relevant because earlier in the chapter it says that we assume there is no bid-ask spread. As for the last answer I feel like it might be an actual answer to the question, but I don't see why a unique risk neutral measure implies completeness. The book's definition for completeness is that you can price a claim, and I don't see how this definition relates to the definition about the uniqueness of risk neutral measures? You agree that the proposition is proven if the equations have a unique solution. You agree that there is a unique solution if u>d. Then we just have to show that u>d. But the definition of u and d is that we have a binomial model where there are two possible outcomes for the stock, a higher outcome su and a lower outcome sd. Hence u>=d by assumption , and in fact u>d because if u=d we do not have a binomial model. Not the answer you're looking for? Browse other questions tagged arbitrage no-arbitrage-theory binomial or ask your own question. Does Black Scholes need to assume no arbitrage?